THE (EVIL) EMPIRE STRIKES BACK! “High-powered lawyers” is an understatement to describe the North Shore powerhouse of attorneys who have been accused of isolating and medicating retired Attorney Marvin H. Siegel of Boxford, Mass. in order to liquidate his estimated $7 million estate. Mr. Siegel has been held as a virtual hostage in his own home, with 24/7 round-the-clock “guards” (medical providers), who, according to one of his daughters, have isolated the 89-year old from close family members for the past five years. Mr. Siegel was placed on lock-down through a court decree of unlimited powers granted to Attorney Brian T. Cuffe, courtesy of Judge Susan D. Ricci (who wrote the order while the presiding judge was on vacation in Italy). Mr. Siegel’s nightmare is complicated, but highlights are contained in Parts 1, 2, and 3 in prior issues of The Boston Broadside. In summary, he was involuntarily committed to a psychiatric facility (Whittier Pavilion in Haverhill, Mass.) by a doctor at Beverly Hospital, following a questionable ambulance transport from his house to the hospital. His evaluation was for potential Alzheimer’s onset. It has been charged that Brian Nagle of BNY Mellon, which held the bulk of Mr. Siegel’s multi-million dollar estate, dispatched Atty. Edward Tarlow and his associate Catherine Watson to the psychiatric facility where, according to Mr. Siegel’s attorney daughter, Lisa Siegel Belanger, Mr. Siegel s was administered drugs and lied to, and unwittingly signed away years of careful, deliberate family and estate planning documentation. Mr. Siegel later experienced a second involuntary commitment at Merrimack Valley Hospital half-a-year later, the daughter charges, after the newly signed documents were used by Attorney Cuffe to further drug and control the senior. The details of that commitment are noted in prior issues of this newspaper. Nightmare is a gentle term to describe the “legal kidnapping,” medication, isolation, and subsequent liquidation of Mr. Siegel’s life-estate. High-profile Attorney Marsha V. Kazarosian, along with Attorneys Cuffe, James E. Feld, and Thomas J. Barbar, have collectively filed a complaint to the Office of the Bar Counsel, Board of Bar Overseers (B.B.O.) of the Supreme Judicial Court in Boston for “professional misconduct” on the part of daughter Lisa Siegel Belanger, who has fought the high-financed lawyers tooth and nail for five years. In their complaint (B.B.O. File NO. C2-12-002476408 – Marsha V. Kazarosian, et. al. ), the lawyers who have controlled Mr. Siegel’s estate – and have drained an estimated $1 million from the estate over each of the past five years (according to court filings) – submitted 101 pages of counter-claims against Lisa Siegel Belanger, inclusive of exhibits which admonish Lisa for speaking to the press. The exhibits include several pages of Boston Broadside coverage of the case. The complaint states that The Boston Broadside was provided with lies by the daughter, but in 101 pages, not one lie is exposed, nor even mentioned. We’ve reviewed the case files (thousands of pages, and exhibits, as well as video and audio tapes and eagerly await clarification in the future on what appear to be a broad-brush tarnishing of Lisa Siegel Belanger for daring to go up against such a powerhouse team of attorneys. Most striking is that Lisa’s exposure throughout this process of multiple other seniors who have suffered similar actions by some of these same lawyers, is not addressed. 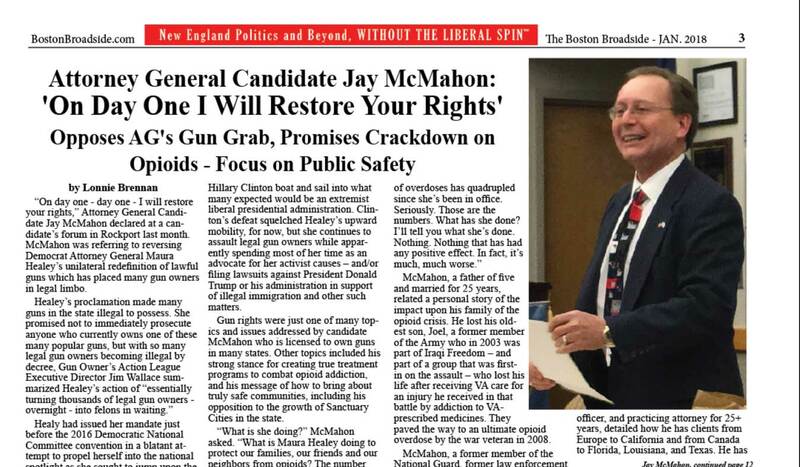 Since the Boston Broadside’s articles have been published in more than 38,000 printed newspapers, as well as online, other media have picked up the story. The question which is repeatedly asked is how Kazarosian and her fellow “untouchables” could have gained so much control over Mr. Siegel. And the recent B.B.O. complaint, when shared with others brings more questions. In the complaint, Kazarosian charges Mr. Siegel’s daughter with exploiting her own father, for spending a fraction ($85,000) of his multi-million dollar holdings. Apparently, most of those funds were actually spent defending Mr. Siegel against the “untouchables.” So, how is this “exploitation” by Lisa, we are asked? And how can Kazarosian keep a straight face saying that the untouchables need to spend millions to defend themselves against Lisa? The untouchables’ complaint against Lisa also spills much ink over a series of contempt-of-court charges made against Lisa. The bulk of the charges were made because Lisa visited her father in the hospital, where he was believed critically ill from complications of various drugs. Lisa took too long to respond to the first contempt-of-court charge, and was subsequently fined multiple times (and re-charged with multiple contempt-of-court charges) until she made payments to certain untouchables to cover their legal fees in prosecuting her for visiting her father, against their wishes. Seriously, truth is stranger than fiction. 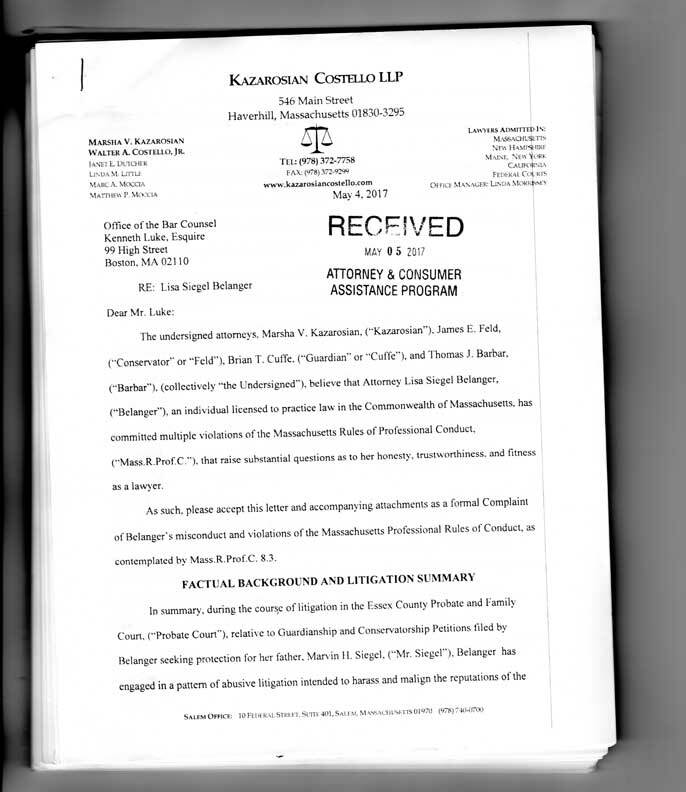 Counter-complaint filed by Attorneys Kazarosian, Cuffe, Feld, and Barbar against Marvin Siegel’s daughter Lisa, claiming she is the reason they have had to deplete millions from his estate to fight her – to protect Marvin Siegel from her exploitation. A further question we’ve been asked is: If Lisa had been guilty of misspending any money, why was she not charged or has had any complaint lodged against her for five years, until she recently went public to the press? Most curiously, we’ve been asked: Why now? Why are these four, high-powered attorneys who took control of Mr. Siegel’s estate, now, after five years, striking out against Mr. Siegel’s daughter, Lisa? Is it because Kazarosian’s, Cuffe’s, Feld’s and other’s actions have “seen the light of day” in a newspaper? 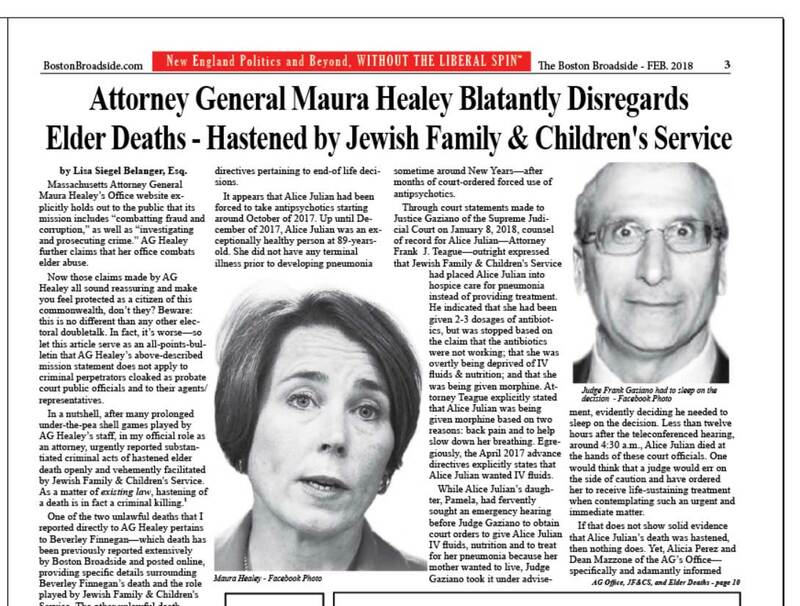 Of interest, Kazarosian has taken out a full-page color advertisement in Massachusetts Lawyers Weekly, a private publication made available to lawyers, stating (in all capital letters): “LAWYERS TRUST MARSHA KAZAROSIAN AND WALTER COSTELLO TO LEAD THEIR BAR ASSOCIATIONS. CLIENTS TRUST THEM TO OBTAIN THE BEST RESULTS.” The ad is estimated to cost in excess of $4,500 according to the publication’s online posted rates. In the ad, Kazarosian is featured in a low-cut top, with a smiling, suited Costello. Kazarosian is the immediate past president of the Massachusetts Bar Association. In addition to a long list of service in various lawyer associations, in January 2016 Kazarosian was appointed by Gov. Charlie Baker to the Supreme Judicial Court Nominating Commission. She had previously served six years with the B.B.O. Notes: Lisa Siegel Belanger had previously filed multiple submissions to the B.B.O. (approximately a dozen, she stated) against Kazarosian and her group during the past four years. Each has been outright rejected, stating that no investigation could take place as it was “pending litigation.” In contrast, Lisa is now forced to reply to the one Kazarosian complaint – the one complaint that seeks to strip Lisa from her livelihood – her ability to work as a lawyer. Lisa filed a complaint of racketeering against Kazarosian, et. al., but the courts refused to consider it, despite multiple attempts (and it has been revealed that more than one court judge is closely tied with Lisa’s opponents!). The lawyers who control Mr. Siegel’s estate continue to try to get him vacated from his $900,000+ Boxford home. And Lisa continues to fight them every step of the way, appeal after appeal. But the case has never been discussed in court – always rejected in the lower courts on technicalities of paperwork filings, never on the merits of connected lawyers isolating, medicating, and liquidating a defenseless senior. With the involvement of such high-powered lawyers and the seeming acquiescence of the judicial system, several people have suggested that perhaps it is time for the U.S. Attorney’s Office to take a look at this entire case. Similar cases of elder mistreatment have also recently come to our attention which we are in the process of investigating. Stay tuned. and racketeering, covered in RICO laws. charge fees to solve it. Same thing is happening in New Mexico. I dared to protest against the attorneys theft of my mother’s trust’s Earned Interest Income through the attorney’s misuse of their IOLTA accounts. I filed a complaint at the New Mexico Disciplinary Board against loss of Earned Interest Income, as well as the court-appointed Trustee’s renewal & subsequent use of my deceased mother’s American Express credit card, and cell phone, and the sale of my mother’s house at well below market value to a former client of court-appointed Trustee. I was punished, not the lawyers. The District Court Judge found me guilty of “making mistakes” and “running to the Disciplinary Board” for every disagreement and since the Chief Disciplinary Counsel had — on his own and without any review by the complete Board — dismissed all my documented complaints against the 6 attorneys involved, I was fined $11,700+ in legal fees, paid to the lawyers to reimburse them for the time they spent defending themselves against my complaints to the Disciplinary Board. The Chief Disciplinary Counsel of New Mexico is Bill Slease (I am not making up that last name.) Slease is an estate planning attorney, and therefore hardly a disinterested party in guardianship and trust cases. Slease had repeatedly and acting on his own and without oversight from the complete Disciplinary Board, dismissed multiple complaints about the same group of attorneys who are conducting a probate racket in New Mexico, much as Kazarosian et al are in Massachusetts. Evidently, the ‘new’ way for probate attorneys and judges to make money, is to steal it from the incapacitated, and the dead. Kellys comment is absolutely factual as our family is still in the Guardianship turnstile of looting and financially abusing the elderly in ABQ, NM. This is a finely tuned well oiled machine. The Judges are at the Helm of the Crime, appointed Corrupt colluded Conservators who themselves has history of abuse to his 2nd wife. These appointees are not vetted, no background cks and have a license to steal with their Law Degree. Bill Slease, Disciplinary Director in NM is part of the collusion. Everyone of the many know who have filed complaints are told they lack supporting documents and that is true. The Trustee who is his friend refuses to provide them to the family’s which is illegal and in direct violation of state statutes and Uniform Probate Codes. We have taken this to the Supreme Court who sat a panel of 16 Judges and Attys, (Appointed will not Sanction these attys even after proof has been filed and provided to Judge of the laws broken by the appointments. NEVER go to an atty in NM and get your parents out of their. ABQ victims first thought is Darryl Millet, Greg MacKenzie, Decades, Tom Schmidt II, Bruce Puma, Barbara Buck, Patrick Westerfield, Vanessa DeNiro, Ruth Pregenzer, Modrall Law Firm, Judith Wagner CPA, Judge Brickhouse/Judge Nash, allegedly have been part of the exploitation “allegedly” for decades looting Elderly Estates. WE POST A FEW ARTICLES HERE, but subscribe to read all the articles, or get a gift subscription for a friend, business, a student, or a neighbor. As the only mass-distributed, non-liberal newspaper in New England, we strive to give voice to the opinions and actions of those who typically get ignored or marginalized by the liberal press. We send out from 1 to 3 e-mails each week, just to update you with events and news about The Boston Broadside. This includes alerts to 'between-printed-issues' special columns, events, and info, as well as e-mails regarding our supporter/subscription campaign, and special events.